Shirtdress Styling: The MIMU MAXI Jean Husband Dress + FLASH SALE!! One of my favorite articles of clothing has always been a classic Shirtdress. With a take on menswear I cannot resist, I am always on the hunt for different colors and versions of this staple. It is a chic minimalist aesthetic that can transition seamlessly from Fall to Spring, and can be dressed up or down. In the world of Fashion, a piece that can be transformed so easily to suit any situation is superlative, and thus invaluable. So you can imagine my excitement when the MIMU girls created the MIMU MAXI Jean Husband Dress. Combining the cool factor of your husband’s favorite button-down, with the perennially perfect choice of denim, the result is a major revelation for your closet. It also doesn’t hurt that it is comfortable; something we all look for when getting dressed. I styled it to emulate a rocker chic vibe, and paired the dress with leather leggings, booties, and a motorcycle jacket. I belted it, wore a black turtleneck underneath, topped it off with a silver collar, and flipped my cuffs up to emphasize the layering. I love the longer length in the back, not to mention the pockets…pockets are everything. I am anxiously awaiting the arrival of their spring line, and I have my eyes on the new dresses coming out! But the best part of this is that MIMU MAXI is having a surprise flash sale any day (this $72 dress will be $40!). Get on their e-mail list at mimumaxi.com to get the details soon! Dress: MIMU MAXI Jean Husband Dress / Leather Jacket: Zara sim / Leggings: American Apparel / Turtleneck: BCBG / Booties: Saint Laurent / Belt: Chanel / Silver Collar: Nicholas via Intermix sim / Sunnies: Prada / Hair: Mazali CLICK HERE TO SIGN UP FOR THE FLASH SALE!!! This entry was posted in FASHION, Outfits, SHOPPING, STYLE, Uncategorized and tagged BCBG, Chanel, mimu maxi, modest fashion, saint laurent, shirtdress, tznius fashion, zara on March 10, 2014 by A La Modesty. Thanks to a collaboration with Pink Label, I was afforded the opportunity to cover some shows this season at Fashion Week and it was, in a word, sublime. Seeing the slideshows via Vogue or Style.com is one thing, but witnessing it unfold in the front row of a live show is a completely different experience. What these designers do season after season is a veritable talent; they can spark in us the desire to see Winter once again, with fresh eyes and renewed enthusiasm. Even in the midst of a seemingly never-ending winter vortex of historical proportions, we cannot help but genuinely look forward to next year’s seasonal drop in temperatures, so we can don the knits that marched down the runways of Delpozo, and Ohne Titel. Or the outerwear in army green and baby blues shown at Wes Gordon’s super chic assemblage. Modest Forecast: Expect to play with proportions, and color; a spectrum of vibrant hues to cool neutral tones were seen in this collection, and it was a refreshing prospect for next Fall. Modest Forecast: Always true to its precedent prints, the show had a more refined silhouette for this collection. Just when you thought they couldn’t get any better, they add inches to their modest separates and dresses. Modest Forecast: As it is their modus operandum, the line showed chunky knits and textured prints, with maroon, cobalt blue, black and white, along with leather and metallics in the mix. Modest Forecast: Two words: Leather, and Fur. It’s what winters were made for. Modest Forecast: This collection showed us a peak into a winter of geometric prints, color, and Karlie Kloss in boiled wool. Modest Forecast: Gordon’s collection showed us a lighter side of Fall with cool colors and airy fabrics. He focused on textures, and the ever-present midi length we have been seeing across runways everywhere. Modest Forecast: Kors created a collection which melded the worlds of unpretentious luxury with classic fall attire. Next Fall will be full of the things you want to wear on a chilly day: cozy oversized knits, dark floral dresses, A-Line skirts, fur, shag and fringe. A whole lot of gray and brown, with small doses of the classic white button down and black skirt thrown in for good measure. The perfect and complete winter wardrobe. Modest Forecast: Designer Michelle Smith sent endless possibilities down the runway. The message was winter-wear can be fun; full of texture, fabric, shine and volume. Modest Forecast: The label’s twenty-fifth anniversary show was a reason to look forward to another Fall come next year, showing an uber relaxed silhouette with midi lengths, cool color-blocking, fur details, and piled layers. This entry was posted in FASHION and tagged BCBG, fashion week, midi, modest fashion, tznius fashion on February 19, 2014 by A La Modesty. I thought I was pretty much done with the modest forecast for Pre-Fall of 2014, when I did my write-up based on the last slew of shows. Then BCBG debuted their collection, and I felt the need to crack open the proverbial can of runway once again. The concept of Pre-Fall is literally what we wear in between the seasons, when we transition from Summer to Fall. Some designers create a collection that rushes into things, and immediately thrusts us into the hands of Autumn, with no polite introductions, and nary a backwards glance. However, BCBG’s Max Azria has created a mostly modest collection that is giving us the faculties necessary to cross the bridge between the warm and cool seasons with ease; not too heavy, not too light. The designer continues to step up his game, and has delivered us a refreshingly sophisticated palette of color and cut to look forward to. It also doesn’t hurt that the brand is relatively reasonable in terms of price, and has made itself accessible to the modest masses. This entry was posted in FASHION, STYLE and tagged BCBG, fall, modest fashion, runway, tznius fashion on December 23, 2013 by A La Modesty. This is the second maxi in a row I have sported, and posted. 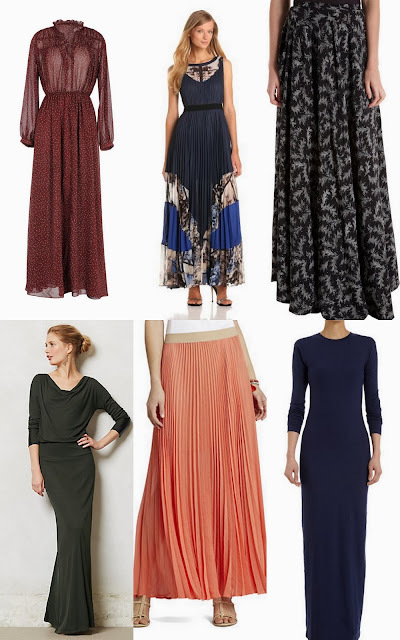 Somehow fall beckons me to don a maxi, just as much as the warmer seasons do, and I love to give in. Especially with this skirt, considering it is very nearly my most beloved item in my closet (one of them, at least). It also doesn’t hurt that it is crafted by my favored fellow Jewess and designer extraordinaire, Andrea Lieberman of A.L.C. The transition is simple, and the result is fabulous; swap a sandal for a boot, throw on a leather topper, fur or chunky knit and, voilà! you’re maxi is ready to bear the cold. All that’s left to do now is…shop. This entry was posted in FASHION, Outfits and tagged A.L.C., BCBG, Leather, Maxi on October 21, 2013 by A La Modesty.